SARAH BERNHARDT Autograph Letter Signed. French actress. Known as 'The Divine Sarah'. ALS on her embossed monogrammed correspondence card. 1p. No place. No date. With the original monogrammed envelope addressed in her hand to Lady Head. 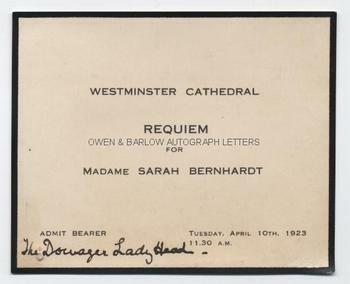 Together with two ticket stubs for the orchestra stalls at the Sarah Bernhardt Theatre dated 3rd February 1908, two telegrams from Sarah Bernhardt to Lady Head, dated 1903 and 1905 (one with original envelope) and the Dowager Lady Head's admittance card to the requiem for Sarah Bernhardt held at Westminster Cathedral on Tuesday, April 10th 1923. The 6 line autograph letter of Sarah Bernhardt is not translated but appears to be a request to Lady Head to attend Bernhardt's 'Tableau'. One telegram is from Sarah Bernhardt at Notting Hill, informing Lady Head that she is to play at Camden on Thursday afternoon and giving her regrets and friendly compliments. 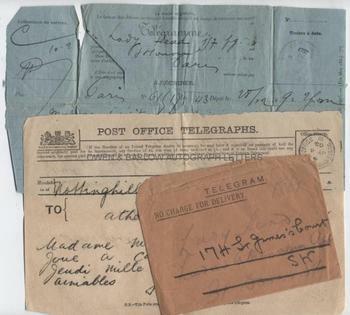 The other telegram is sent from Paris and is untranslated but appears to inform Lady Head that she is performing every day but is leaving for home in three hours and that it would be a joy to see her on Tuesday or Wednesday before 4. 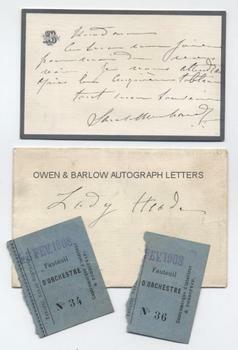 The requiem ticket is on black edged card with Lady Head's name written in ink in lower left corner. The ALS on card measures approx 5 x 3 inches and is in exceptionally fine condition, having always been contained in its original envelope. One telegram has a slight tear where it was carelessly opened but it is otherwise fine, as are the other items. Sarah Bernhardt was unquestionably the greatest actress of the 19th and early 20th centuries and, possibly, the greatest actress of all time. She can certainly lay claim to having been the most famous. 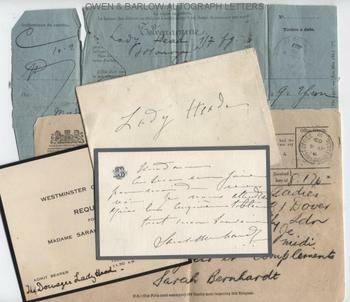 The recipient of the letter is Lady Florence Julia Head (nee Pollock) (1853-1931), wife of Sir Robert Garnett Head, 3rd Baronet Head of Rochester. She was an active member of the Ladies' Athenaeum Club and an active correspondent with a number of eminent writers, scientists and authors, including MARIE CURIE and Marie Corelli.